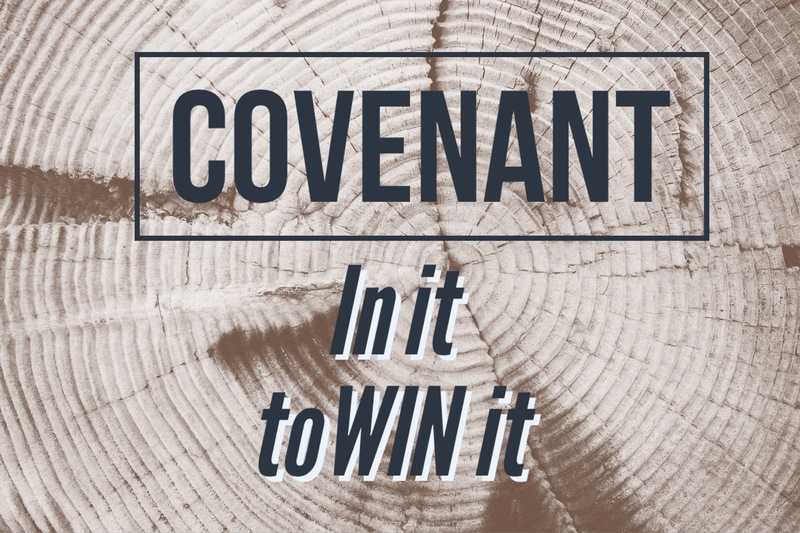 Covenant: In it to Win it – Stew Rd. Recently, we have been talking about the purpose of covenant relationships in our lives. There are a few examples of covenant in the Bible with some of the main ones being the Noahic Covenant in Genesis 9, the Abrahamic Covenant in Genesis 12, the Mosaic (Old) Covenant and the New Covenant offered through the life and death of Christ. There are also other examples of covenant such as the marriage covenant between a man and a woman (Genesis 2) and the covenant between David and Jonathan in 1 Samuel 18. Covenant is something we are not as familiar with in our time. We are more familiar with the idea of a contract which is largely drawn up to protect and benefit oneself in a transaction. Covenant is something much deeper. A contract is an agreement to get something, but a covenant is an agreement to give something. Covenant is a pledge and life-time commitment of mutual support and benefit. In Genesis 15, God made a covenant with Abraham that involved a sacrifice signifying two parties joined together. It alluded to the ultimate covenant that would come through Christ and us being made one with Him in covenant relationship. Covenant is a promise to give the best of me and a promise to find the best in you. Covenant is a promise to stay when others go. It is a promise to give my all and to give my best. It gives and it receives but it also requires because it has purposed to cultivate the best in each other. We live in a day of “upgrade”. When the latest iPhone comes out we want an upgrade. When a better opportunity in business comes up, loyalty takes a back seat for an upgrade. When a marriage relationship gets difficult and someone else shows up it is too often a chance for an upgrade. Covenant doesn’t look for an upgrade. Everything you need is available in the covenant relationships God provides. Those who have been born again are in covenant with God. That is a little different from a covenant between people because we don’t require or push Him to be better than He already is. He is offering His best and drawing the best out of us. Ideally, our birth family is supposed to a covenant type relationship. There is a commitment to love, support and sacrifice for one another but we also encourage those in our family to reach their potential. Marriage is another form of covenant that was established by God in Genesis 2 when he said a man would leave his father and mother to be joined to his wife. Marriage is designed to make us more whole and effective that we could be alone and to reproduce and bear fruit (offspring). Most people never reach their full potential because it requires more than they want to give. For example, how fast can you run a mile? At this moment it may take you 30 minutes to walk a mile but could you go faster? Of course. With consistent effort your time to complete a mile would drop until you reach your potential. An average time for someone in good physical running condition is between 8-10 minutes. The top 1 percent of runners in their age group run a mile between 6-7 minutes. Would you want to guess the world record time for running a mile? The world record time is 3 minutes and 43 seconds by Hicham el Guerouj. That is nothing short of a super human feat of endurance that was realized through much personal hard work but also with coaches, training partners and other world-class runners that put a demand on him to go faster than he or anyone else had ever run a mile before. Have you ever noticed that world record track times are set in a race with others? Someone is there encouraging, challenging and pushing them to be their best. It is the same with you and I. There is God-given potential inside of us to reflect and represent Christ in the earth to see His kingdom come around us. There is no limit to the gifts and potential of God in each of us. Covenant relationships encourage and challenge you to go further and be more than you could ever be on your own. Covenant relationships will provide benefits on the surface, but they eventually will require us to deal with the character issues in our heart that eventually put a ceiling on our ability to grow and be fruitful in an area of our life. Covenant eventually requires personal responsibility and growth instead of blame because you have bound yourself to be a part of the solution for both parties involved. There will be relationships you have that are temporary for different reasons, but there are some relationships God has given that are meant to be long-term for the purpose of being more than either party could have been alone. Beyond your covenant with God, spouse and family, who has God brought into your life in a long-term relationship that makes you better and more fruitful than you were before? Pingback: Your Happy Brain, Connection and the Science Behind It – Stew Rd.